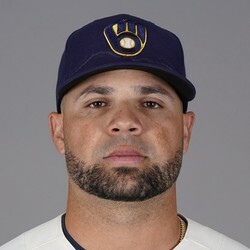 Manny Pina went 1-for-4 with an RBI single in the Brewers' 1-0 win over the Reds on Wednesday. Offense was hard to come by for both teams in this one, and Pina's RBI single in the second was all the support Freddy Peralta needed on the day. Pina is a backup catcher, and unless something happens to Yasmani Grandal Pina has zero fantasy value.